Squadrons under Command 3 pcs. Aircraft in Squadron 4 pcs. 102 mm/45 QF Mk XIX6 х 2 pcs. Initial HE Shell Velocity811 m./s.
. . . Firing Range5.01 km. 20 mm Oerlikon Mk IV9 х 1 pcs.
. . . Firing Range2.01 km. 40 mm/39 QF Mark VIII6 х 8 pcs.
. . . Firing Range2.49 km. Turning Circle Radius1 070 m.
20 mm Oerlikon Mk V6 х 2 pcs. Furious — British Tier VI aircraft сarrier. A relatively large warship that was initially laid down as a battlecruiser, before being refitted into a full-fledged aircraft carrier in several steps. The ship was finally commissioned by the Navy in 1925, and held the status of being the fastest carrier at that time. HMS Furious was a modified Courageous-class battlecruiser built for the Royal Navy (RN) during the First World War. Designed to support the Baltic Project championed by the First Sea Lord of the Admiralty, Lord Fisher, the ship was very lightly armoured and designed to be armed with only two heavy guns (18-inch), one forward and one aft, plus a number of lesser guns. Furious was modified and became an aircraft carrier while under construction. Her forward turret was removed and a flight deck was added in its place, such that aircraft had to maneuver around the superstructure to land. Later in the war, the ship had her rear turret removed and a second flight deck installed aft of the superstructure, but this was less than satisfactory due to air turbulence. Furious was briefly laid up after the war before she was reconstructed with a full-length flight deck in the early 1920s. After her conversion, Furious was used extensively for trials of naval aircraft and later as a training carrier once the new armoured carriers like Ark Royal entered service in the late 1930s. 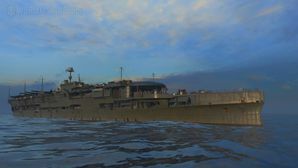 During the early months of the Second World War the carrier spent her time hunting for German raiders in the North Atlantic and escorting convoys. This changed dramatically during the Norwegian Campaign in early 1940 when her aircraft provided air support to British troops ashore in addition to attacking German shipping. The first of what would be a large number of aircraft ferry missions was made by the carrier during the campaign. After the withdrawal of British troops in May, Furious made several anti-shipping strikes in Norway with little result before beginning a steady routine of ferrying aircraft for the Royal Air Force. At first Furious made several trips to West Africa, but she began to ferry aircraft to Gibraltar in 1941. An unsuccessful attack on German-occupied ports on the Arctic Ocean interrupted the ferry missions in mid-1941. Furious was given a lengthy refit in the United States and spent a few months training after her return in April 1942. She made several more ferry trips in mid-1942 before her aircraft attacked airfields in Vichy French Algeria as part of the opening stages of Operation Torch in November 1942. The ship remained in the Mediterranean until February 1943 when she was transferred to the Home Fleet. Furious spent most of 1943 training, but made a number of attacks on the German battleship Tirpitz and other targets in Norway during the first half of 1944. By September 1944, the ship was showing her age and she was placed in reserve. Furious was decommissioned in April 1945, but was not sold for scrap until 1948. Furious as originally completed. She had a flying-off deck for aircraft forward. Stern view of Furious in 1917, showing the ship's single 18-inch gun. Oblique view of Furious at anchor before her armament was installed. Her retractable charthouse is prominent at the forward end of the flight deck. This page was last modified on 21 March 2019, at 06:36. This page has been accessed 8,001 times.